The changing of the guard ceremony is one of the most popular attractions for visitors to Stockholm, Sweden. This free 40-minute changing of the guard event in front of the King of Sweden's residence takes place every day of the year. From April 23 to August 31, the ceremonial march through central Stockholm is accompanied by a full military band from the Swedish Armed Forces Music Centre. Sometimes the guards can be seen approaching the royal palace on horseback, especially on April 30, the king's birthday. Other special events in the summer include Sweden's National Day on June 6, and gun salutes from Skeppsholmen at noon on the Crown Princess's birthday on July 14 and the Queen's name day on August 8. The changing of the royal guard is accompanied by a gun salute from Skeppsholmen at noon on December 23 to mark the Queen of Sweden's birthday, and on January 28 in honor of the King's Name Day. March 12 is the Crown Princess's name day, which is celebrated in the inner palace courtyard. The royal guard ceremony begins at 12:15 p.m. on weekdays in the outer courtyard of the royal palace. On Sundays, the event takes place at 1:15 p.m. In autumn, starting on September 1, the parade is generally held only on Wednesdays, Saturdays, and Sundays. The parade departs from the Army Museum at 11:45 a.m. and on Sundays at 12:45 p.m. If there is no musical accompaniment, then the guards' march from the obelisk at 12:14 p.m. on Wednesdays and Saturdays, and at 1:14 p.m. on Sundays. In winter from November to March, the event is not as big but is still worth watching. During that time, the royal guard publicly changes on Wednesdays and Saturdays, departing from Mynttorget at 12:09 p.m., and on Sundays and public holidays at 1:09 p.m. If there is no musical accompaniment, the royal guards march from the obelisk at 12:14 p.m on Wednesdays and Saturdays, and at 1:14 p.m. on Sundays. The holiday season often includes additional events. The royal guard has been stationed at the royal palace in Stockholm since 1523. About 30,000 guards from the Swedish Armed Forces take their turns standing watch. 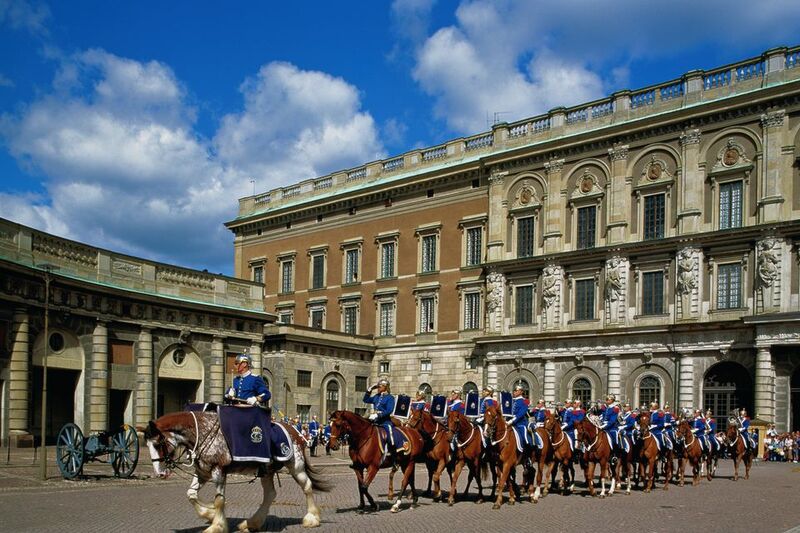 The guards are responsible for safeguarding the royal palace and are also part of the defense of Stockholm. They are an important part of the security force for the capital's citizens. The royal guard takes part in royal ceremonial occasions, official state visits, the official opening of the Swedish Parliament, and other national events. The royal palace, also known as Stockholm Palace, is the official residence and major royal palace of the Swedish monarch. It is located in Stadsholmen in Gamla stan in the capital city of Stockholm. The offices of the king and other members of the Swedish royal family, as well as the offices of the royal court of Sweden, are located there. The palace is used by the king as he performs his duties as head of state.